Another Cromarty Gala Queen photo. Can't make out the date, but perhaps late 70s or early 80s. 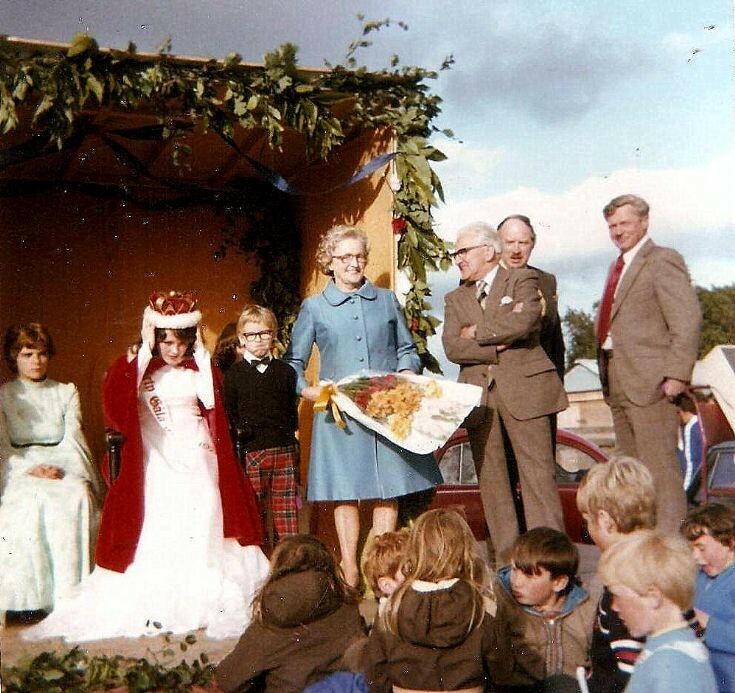 Not sure about the Queen, the Attendants or the kids in front, but the other figures are my Father and mother (Daldon and Betty Ross), Donald Matheson at rear, and Duncan MacPherson on the right. Next to Mary McEwan is her brother Anthony. Fantastic collection of photographic archives of all descriptions of Cromarty & her people I have spent many hours looking through them. but have yet to come across a photo of Jock Singh's Café on Bank St. In my teenage day's we'd gather there with our [Chicks] put a dime in the Jute Box & listen to that good old Rock-n-Roll. Elvis & Cliff. we didn't have The 2 I'S Coffee Bar like they had in London or The Cavern in Liverpool. but Jock Singh's café did the business. Jock was a bus driver in Glasgow latterly come on you Croms of my generation some photos please an old Rocker!